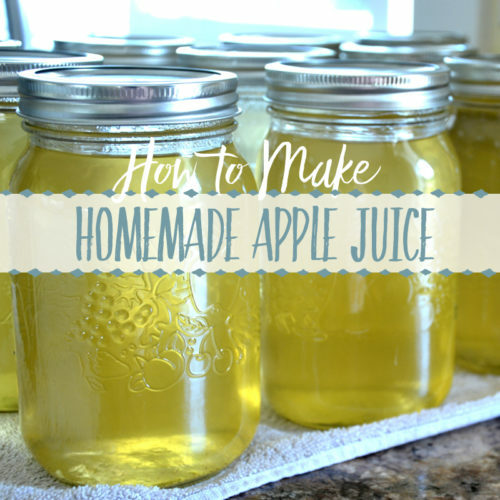 *Are you searching to learn how to can homemade apple juice that is clear? 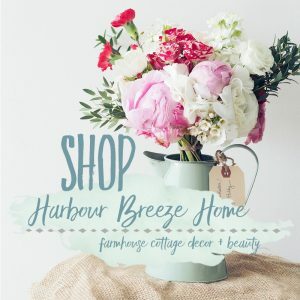 If so, read on. 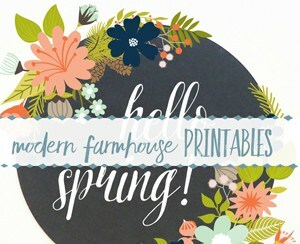 This simple step by step process is a recipe I learned from my Mother-in-Law. My mom was a canner. Summertime for her was working in the garden ~ picking beans, cucumbers, corn, peas, & tomatoes. 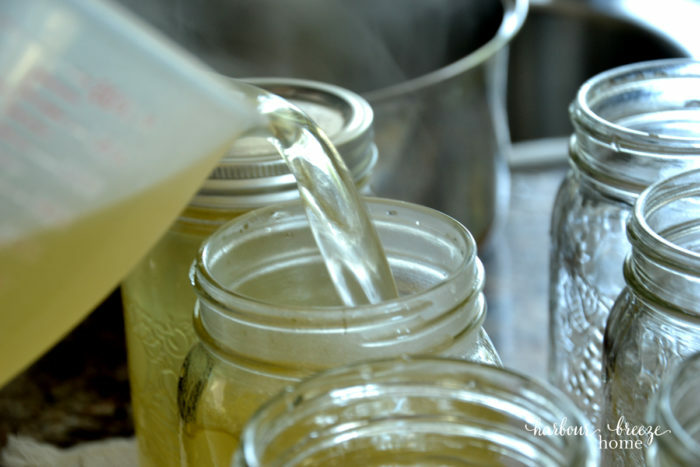 Then she would cut, shell, snap, and blanch until things were ready for canning jars and boiling water baths. I must say, I did my share of helping (reluctantly, if I’m honest) in those days, but I didn’t grow up to be a virtuous canning woman. But, over the years I’ve gingerly dipped my toes into the world of canning. Blackberry jam is my favorite. And, when our son from Alberta was here a few weeks ago, he reminded me of the apple juice we did a few times. He wanted to take some back to his friends, so he did almost all the work, and we helped at the end and took pictures of the process! 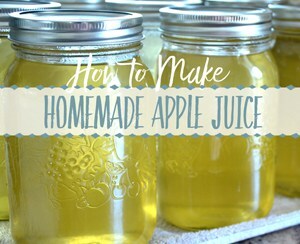 My mother-in-law taught me this great way to make apple juice. It’s relatively simple, and I love how it turns out pure and clear. 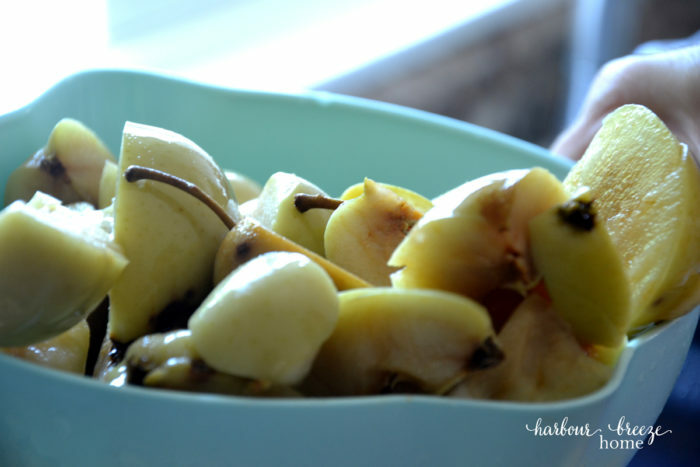 1.Chop apples into 4-6 pieces each and place in a large container(s). 4. Drain the juice from the chopped apples. We first used a strainer to scoop out the large chunks. 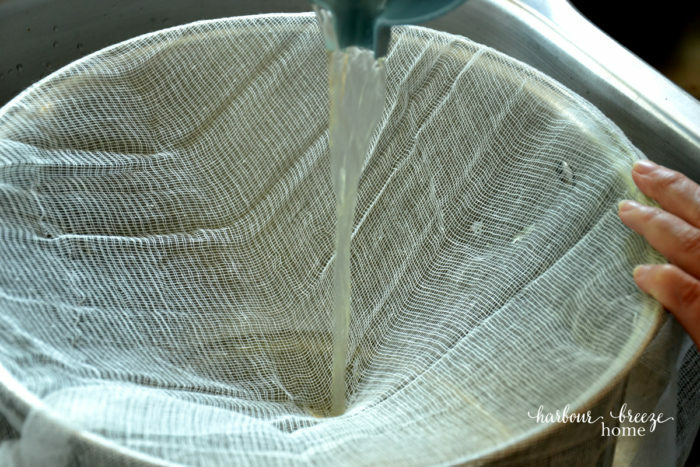 Then we poured the juice through a cheesecloth into a pot to catch any extra bits. 5. 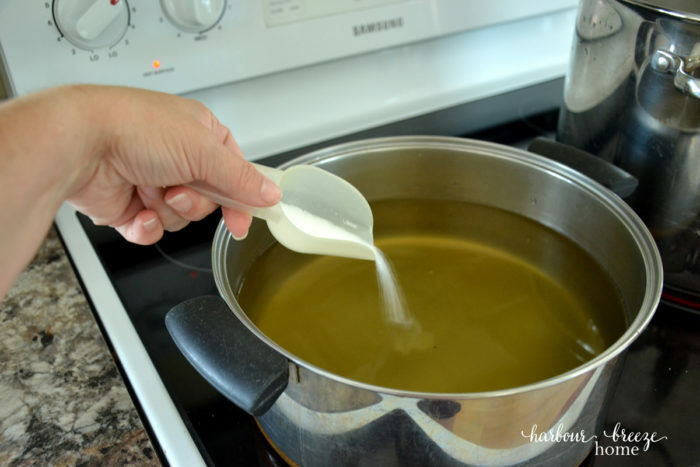 Once the juice is all strained, place the pot(s) on the stove and add sugar to taste. This is a completely “to taste” scenario based on the type of apples and how sweet you like it. I start with a little and add more if needed. 7. 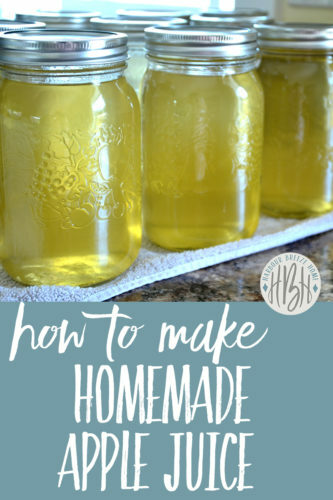 Pour hot juice into sterilized jars. 8. 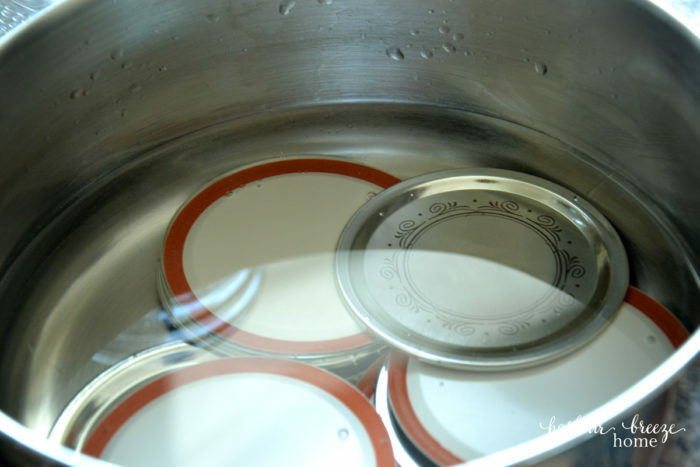 Place a hot lid (that has been in boiling water) onto the jar and secure tightly with the jar ring. 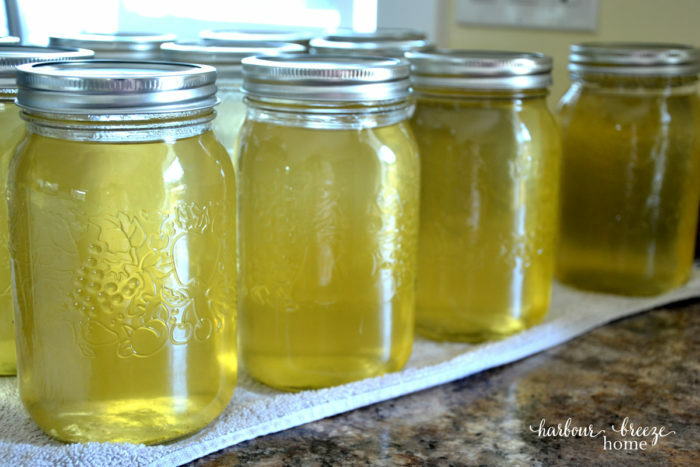 9.Wait until they cool and listen for the “pop” of the jars sealing. PS. And if you’re really on a canning roll, you might want to try some blackberry jam (no pectin required…), too! Oh my stars. I’m totally doing this. We did it and it turned out delicious! What is the apples to water ratio that you use? What do you do with the apples after you strain the ? I also need to know quantities! Wondering why no hot water bath? The recipe I used didn’t call for a hot water bath. I’m not sure why? ~ But I’m sure it wouldn’t hurt if you wanted to do it. Regarding quantities, use enough boiling water to just barely cover the cut up apples. The amounts will vary depending on how many apples you use. Sounds like a great method for getting the juice…..but now how do you use that juice in making jelly? I have no idea how much sugar to add to the already sweetened juice etc. Do you have a basic recipe for that? Thanks so much. What’s a good apple to use for this? what type of apples is best. I tried and maybe I didn’t wait long enough or maybe I used wrong kind of apple but the juice was weak almost no apple flavor. wont the juice get bad keeping in room temperature for 24 hours , why not refrigerate for 24 hrs. I highly recommend waterbath canning this recipe. I know it’s a pain but it really would be the only way to ensure a safe product. What a fabulous way of getting apple juice. I have used this recipe and it is brilliant. Lovely taste and it is clear as. Thank you for sharing this with the world. does this method work for other types of fruit, for example pears?